I want to make new pillows for my living room, but I'm having some design issues. I'm not sure how to mix patterns. See I already have a gray and white rug with a very distinct pattern. 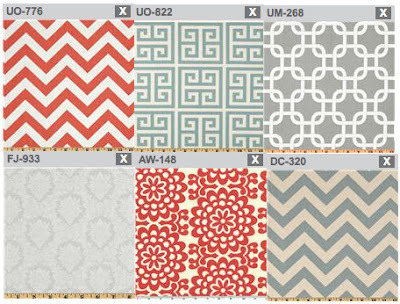 I want to have some pillows with pattern and color to brighten this place up a little, our house right now is semi monochromatic, but I'm not sure if my fabric choices (below) work. Is it just too much pattern when combined with my rug? I really like the coral as it looks pretty paired with gray, and the light blues and grays match our walls. And aesthetically speaking, is it okay for all the pillows to have a different design or should I have some pillows that are made with the same fabric? Suggestions are welcome. My inspiration: I love how this person was so bold with her fabric choices for her pillows. All of them are patterned and blend together so nicely, and they are bright, cheery and pretty. I love those fabric choices! Where did you find them? I think they would go really well in your home. And, of course, if you end up not liking one or two of the pillows you can always swap it out with another design. I like all the fabric choices as well, I think they will look great. Also, maybe throw in a navy blue design? Don't be afraid to go with bold colors!! I know what you mean about wondering about mixing patterns. I struggle with that a lot! But I love all the swatches you chose.